When you walk into Adil Akthar’s studio, there is something about the massive canvases dripped with vibrant paints draped around the room that will leave you in awe. When you walk into Adil Akthar’s studio, there is something about the massive canvases dripped with vibrant paints draped around the room that will leave you in awe.Deciding to conduct our interview in his studio, Akhtar grabs a chair and places it directly on one of his blank canvases on the floor, an odd act that catches me off-guard. 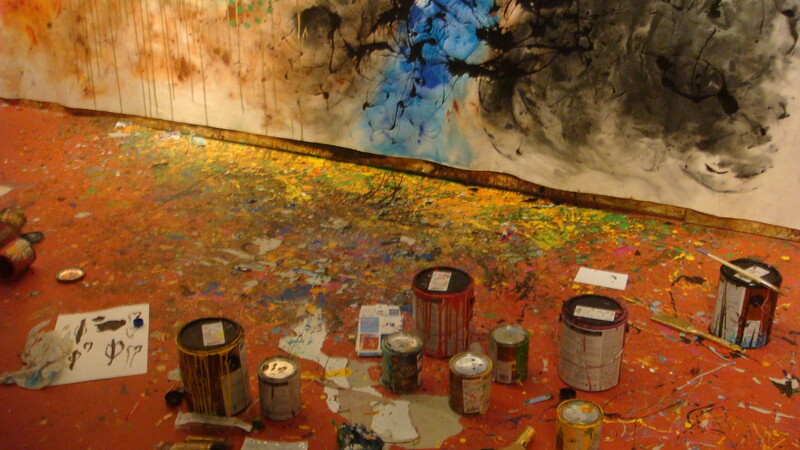 I walk across the paint splattered floor, navigating through a maze of opened paint cans, acrylic paint tubes, and scattered works-in-progress, taking my seat at the edge of the canvas. All the while I’m wary that the legs of my chair may leave marks upon the pristine surface of Akhtar’s canvas. Our interview begins with the discussion of Akhtar’s past. Losing his father at two years old, Akthar had to grow up quickly to take the place as the man in the family. With the events that rocked Pakistan during his youth, Akhtar also had a few stints involved with political happenings in his country, as did many young people of his time. Soon though, he decided to pursue a career in medicine and eventually left Pakistan for the United States following medical school. After his residency at Wayne State, Akhtar did a research fellowship at Johns Hopkins. The odd hours of his time at the lab allowed him to pursue a rather creative interest, reading about art history. It was at this point that art began to infuse his life. With Manet and Van Gogh catching his eye, it is rather clear to see why Akhtar began his artistic pursuits with oil paints on a small canvas. However, the evolution of his art to a more personal side was unavoidable. In his most recent exhibition, Revelations, Akhtar focuses on the history of Islam. 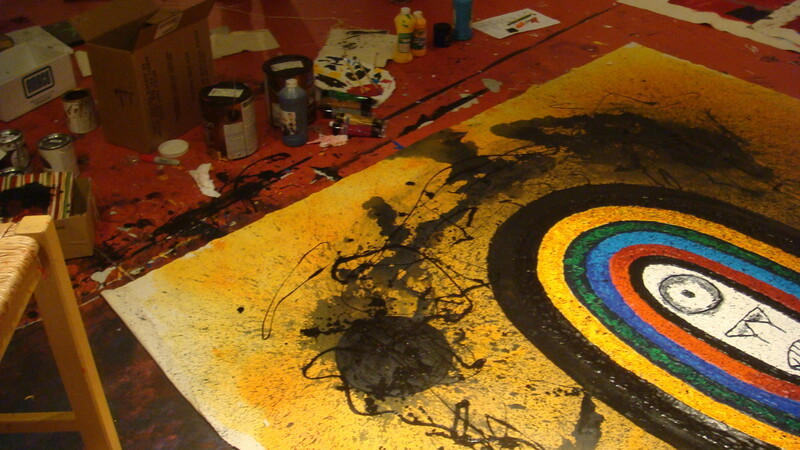 Vibrant colors applied upon the canvas are contrasted with black paint, which he uses to symbolize evil and negativity. Long gone are the traditional aspects of Islamic art. No arabesque figures, no geometric designs, no miniature paintings that have boomed in the Pakistani contemporary art scene. 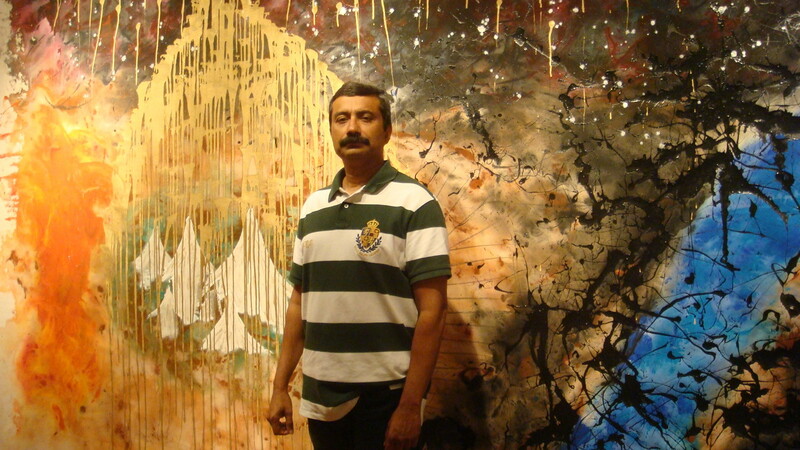 Instead, Akhtar’s paintings are Pollock-esque, and his process of creating each work emulates that of the renowned abstract expressionist. In fact, the drip technique Akhtar uses is instantly recognizable as it takes it place on the canvas, layered upon symbolically drawn mountains or spider webs. One by one, each line, each shape, each splash of paint pieces together to tell the viewer of a crucial moment in the history of Islam. What may first appear to be a jumble of splotched paints and shapes can be taken apart: a small group of green dots represents the 72 fighters captured and killed in Karbala (a defining moment in the separation between the Sunnis and the Shias), singular drips of gold paint take the place of angels, while a column of blue paint is cut off with splatters of black paint to signify Husain ibn Ali’s forces being cut-off from the Euphrates river. One by one, each line, each shape, each splash of paint pieces together to tell the viewer of a crucial moment in the history of Islam. For the future of artists in America, he hopes that others will work to place prominence on South Asian art in contemporary times. As for Akhtar’s future, his goal is not to become a commercial artist, but to create art for the pure joy of sharing his work with others. In the hour’s time that I spoke with Adil Akhtar, one thing was abundantly clear: he is a phenomenal storyteller. In a few weeks or months, the unprimed canvas that served as the site of our interview will be the site of another story, not one about his life per se, but the continuation of whichever chapter of history Adil Akhtar seeks to paint next. Indrani Saha is a SAADA Digital Archive Intern for Fall 2012.